The top line of Jason Zucker of Las Vegas with Eric Staal and Mikael Granlund has 11 goals, 15 assists for 26 points in the last three games for the NHL Minnesota Wild. //Ross McMullan scored his 3rd goal of the season and Chris Francis had two assists for the Wheeling Nailers in a big 6-3 road win over 33-18-0 division leader Manchester Monarchs before 4272. Important California NARCh Qualifier Details! Our first regional qualifier is coming up in less than 2 weeks, March 10th-11th in San Jose. There are less than 24 hours left to register for that event. The schedule will be released this Friday, March 2nd. Our next qualifier will take place on March 23rd-25th in Huntington Beach. This event will start on Friday but AFTER SCHOOL! Registration deadline is March 5th! The Irvine Qualifier takes place on April 26th-29th. This is our largest regional event each year, as over 120 teams competed last year. Registration deadline is April 5th! If your team has players that cannot miss school, please skip this tournament and play in Huntington Beach or Escondido instead! If a team registers for the tournament and forfeits a game, that team will NOT be eligible for the playoffs or championship. Rounding out our California Qualifiers is the Escondido NARCh Qualifier on June 1st-3rd. The earliest games would be played is on Friday Night, but this likely will only be a Sat/Sun Tournament. We hope this information helps your team prepare for the upcoming tournaments and we look forward to seeing you at a rink very soon! For any NARCh related questions feel free to emaildaryn@narch.com. //OT – Vegas Golden Knights led practically entire game in an all-out war of a game, then LA Kings scored twice in 3rd period and again in OT to win 3-2 in one of the best most intense high action games we have seen this season. On Tuesday the two teams go at it again at the T-Mobile Arena in Las Vegas. 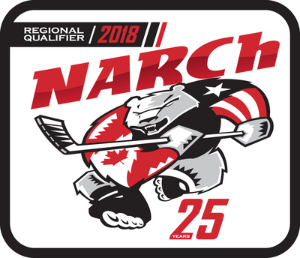 Noelville, Ontario, Canada – Adrian Nicholas of Las Vegas assisted on the first goal of the game for the NOJHL French River Rapids in a 5-4 loss to the powerful division leader Soo Thunderbirds on Sunday at the Noelville Arena. Adrian has three assists this season for French River Rapids. Adrian, 20, is in his 3rd season with French River Rapids. He is listed at 6’1, 175. Escondido, Ca. 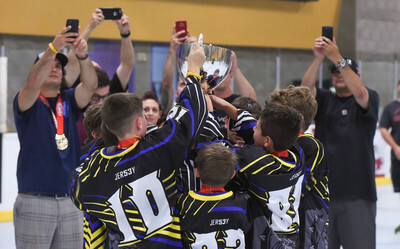 – “We got off to a slow start, lost, but please know our players play with all their heart and pride,” said GM/Head Coach Adam Stio after the Las Vegas Cavalry lost 10-3 to the San Diego Skates in a Mountain West League game at the historic Iceoplex on Saturday night. 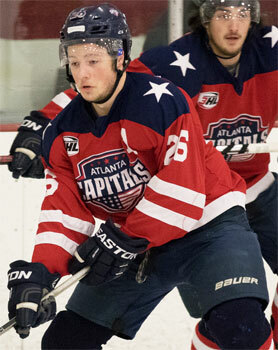 Ryan Rinko scored two goals, Richard Prekop one goal for Las Vegas Cavalry. Gage Quinney of Las Vegas and Wilkes-Barre/Scranton Penguins vs Hershey Bears at Mohegan Sun Casino, Casey Plaza, Wilkes-Barre, Pa.
Ross McMullan of Las Vegas and Wheeling Nailers vs Adirondack Thunder at Cool Insured Arena, Glen Falls, N.Y.
Wisconsin Rapids – Michael Cichy of Las Vegas and the USPHL Premier Ironwood Fighting Yoopers lost a very tough playoff eliminator game 4-3 in OT to the hometown Wisconsin Rapids RiverKings here at the South Wood Rec Center on Saturday night. The RiverKings won the best of three, two games to none. Michael is a former RiverKings goal scorer. He then moved on to the Wisconsin Muskies, then went to the Ironwood club.